Note: This post was updated on April 11, 2019. This credit is a bit weird, as you have to select the airline you want it applied to, and can only change that choice once a year, but anyone interested in a card like this should easily be able to cross the $200 mark annually on things like checked bag fees, change fees, pet fees, and in-flight food and beverage purchases. This credit(s) is doled out in up to $15 monthly increments (and up to $35 in December). There’s no rollover if you don’t max it out in a month, but you don’t even need to pay with your Platinum to get the credit- just connect your card to Uber and you’re set. I actually didn’t know Uber VIP existed until I got the Platinum card. It’s basically UberX, but ensures you only get drivers with high ratings and quality cars. However, since using it, I’ve started getting small (~$2) discounts on Uber VIP rides. The American Express Centurion lounges are the best in the country, so if you regularly fly out of or in to an airport that has one, this perk can be a game-changer for your travel, and your first two guests are free. The Platinum also includes an enhanced Priority Pass membership, which lets you bring in two guests at no extra cost. As with TSA Pre, if you don’t already have a Priority Pass membership, this is a huge bonus. Finally, the Platinum includes entry to Delta Sky Clubs, though you have to be flying Delta that day to get in, and guests are $29/piece. I had never heard of Airspace Lounges until I got the Platinum, but since I do most of my flying out of JFK’s Terminal 5, access to those is a huge win for me. If you don’t already have TSA PreCheck, you’re subjecting yourself to a lot of unnecessary pain. The Platinum certainly isn’t the only card to offer this credit, but if you don’t already have PreCheck, this is a great pot sweetener. Note: Global Entry includes TSA PreCheck. We could, and will, write whole articles on these hotel statuses, but in the meantime feel free to ask further questions in the comments. I’m two for two on room upgrades since getting the card. We’ll be digging in to these more as we cover the rental car game, but if you regularly rent cars these perks can really add up. Get up to $100 back as statement credits each year on purchases at Saks: $50 from January to June, and $50 from July through December. I have a lot of feelings about cruises we’ll be discussing soon, but one good thing to know about them is that you can find insane deals and stack more insane deals on top of already insane deals. There are regularly cruise deals available where the net cost of being on the cruise each day is cheaper than feeding yourself in New York City. The Platinum gets you a $100-$300 onboard cruise credit, depending on your room type, plus some other bonuses depending on which cruise line you sail with. Free access to Boingo Wifi hotspots. Amex Offers are targeted, so you really have to pay attention to make use of them, and manually add them to the card when you see one you might want take advantage of. It’s worth it though. I immediately got an offer for a $60 statement credit after spending $300+ at Starwood properties, which I was going to do anyway. That on top of the room upgrades, welcome gifts, etc. For an extra $175/year, you can add up to three authorized users to your Platinum, but since those users get the same lounge access, hotel status, and Global Entry credits you do, this can be a huge benefit. You won’t often find an article recommending a credit card that doesn’t open by discussing its bonus categories and sign-up bonus, but we wanted to illustrate the potentially massive value the Platinum offers in perks alone, depending on your travel habits. In my opinion, once you reduce the annual fee to $150 with the airline and Uber credits, the lounge access OR hotel statuses easily cover the remaining cost on their own, but of course this is all subjective. 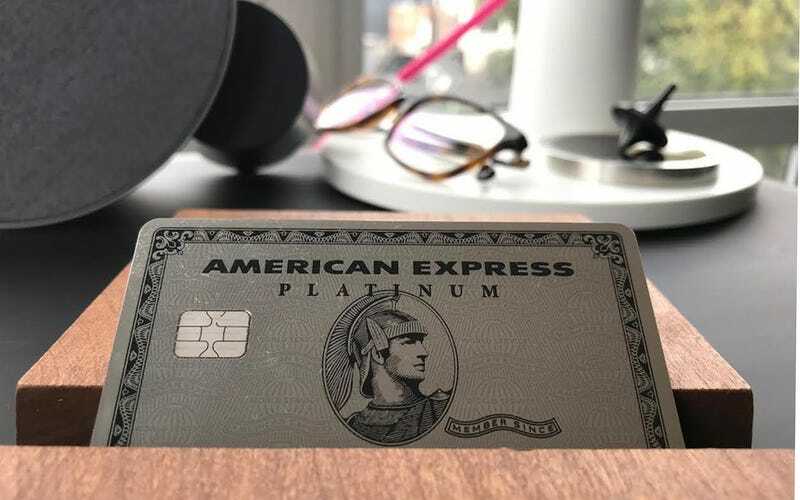 The Amex Platinum is currently offering a 60,000 point bonus after spending $5000 on the card in your first three months, which is worth around $1100 according to The Points Guy’s valuations. With the Platinum, you’ll get 5X points on air travel booked directly through the airline or through Amex, and 5X points on eligible hotels booked through amextravel.com. There’s no getting around the fact that that hotel booking requirement throws some cold water on things, and we hope to see that changed in the future. The points you earn with your Platinum, known as Membership Reward points, can be transferred to 20 different hotel and airline partners, so playing your cards right can increase your returns even more. The Amex Platinum is the travel card that keeps on giving. We didn’t even manage to cover all of its perks here, and if you get one, you’re likely to continue to discover more benefits as you go, from ShopRunner memberships to reserved seating at events to discounts on international flights. We talk a lot about sign-up bonuses and point redemption values when it comes to credit cards, and the Platinum certainly has those in spades as well, but what we really love about this card is that, even if you spend $0/year on it, you’re getting a mountain of enhancements to your travel experience for an effective $150/year. Worth it.